Previous Artists in Residence - Käte Hamburger Kolleg "Recht als Kultur"
Maria Eichhorn, born 1962 in Bamberg, Germany, is an internationally renowned contemporary German artist. Her artwork has a particularly unique signet: She pursues abstract themes that are to a large extent shaped by law, such as ‘property’, ‘capital’, ‘joint stock companies’, and ‘restitution’, and awards them an artistic, appellative character. This was especially apparent in her projects Maria Eichhorn Aktiengesellschaft and Rose Valland Institut, which were displayed at the documenta in Kassel, Germany, in 2002 and 2017. Rose Valland Institut, which addresses the expropriation of Europe’s Jewish population and its consequences up to present day, is a part of her research at the Käte Hamburger Center for Advanced Study “Law as Culture”. She has hold the Artist in Residence position and Georg Simmel Art Fellowship here from October 2018 to March 2019. Maria Eichhorn studied under Karl Horst Hödicke at the Berlin University of the Arts from 1984 to 1990. In 1986, her first exhibitions took place. In 1999, Maria Eichhorn was Guest Professor at the California Institute of the Arts in Valencia. Since 2003, she has been a lecturer at the Zurich University of the Arts. Aside from her well-known pieces showcased at the documenta in Kassel and Athens, her works have also been on display at the Chisenhale Gallery in London (2016), the Haus der Kulturen in Berlin (2015), the Biennale in Venice (2015), the Morris and Helen Belkin Art Gallery in Vancouver (2015), and the Kunsthaus in Bergenz (2014). In 2018/19, the Migros Museum in Zurich will hold the exhibit Zwölf Arbeiten / Twelve Years (1988–2018), which includes pieces from the last 30 years. Maria Eichhorn has received numerous awards for her artistic achievements, including the George Maciunas Prize (1992), the City of Kassel’s Arnold Bode Prize (2002), and the University of Turin’s Paolo Bozzi Prize for Ontology (2018). Her project, The Rose Valland Institut, is an interdisciplinary and independent art project. It examines and documents the expropriation of Europe’s Jewish population and its consequences up to present day. It was named after art historian Rose Valland, who kept detailed secret lists about the Nazi’s plundering that took place during their occupation of Paris. After the war, she worked for the Commission de Récupération Artistique (Commission for the Return of Art) and significantly contributed to the restitution of Nazi-looted art. Going beyond Maria Eichhorn’s previous exhibition projects Restitutionspolitik / Politics of Restitution (2003) and In den Zelten... (2015), the Rose Valland Institut addresses the topic of unresolved property and ownership relations from 1933 until today. The Institut prompts questions about the possession of art, land, property, assists, companies, transportable objects and artifacts, libraries, academic works, and patents that were stolen from Jewish owners in Germany and other occupied countries during the Nazi era and have yet to be returned. With the call for papers for Verwaistes Eigentum in Europa, the Rose Valland Institut made its public debut in March 2017. With the open call for Unrechtmäßige Besitzverhältnisse in Deutschland, the Insitut was able to take its work one step further. The public was asked to research stolen Nazi property that they may have inherited and share this information with the Rose Valland Institut. The Institut was established on the occasion of documenta 14 and on display from June 10th to September 17th, 2017, at the New Gallery in Kassel. During her time at the Käte Hamburger Center for Advanced Study “Law as Culture” at the University of Bonn, Maria Eichhorn will continue working on her piece Rose Valland Institut. Cheikh Ndiaye, born 1970 in Dakar, is a contemporary painter and artist. He graduated from the National School of fine Arts in Dakar in 1998. Furthermore he obtained a Diplôme National Supérieur d'Expression Plastique from the School of Fine Arts in Lyon, France, in 2008. He has participated in numerous exhibitions in Europe (e.g. at the Venetian Biennale in 2015), Africa and the United States. His works were honoured with the Natulis Art Temporary prize in Berlin, Germany, in 2012, the Linossier prize in France in 2008, and the Marin Prize for Painting in Paris in 2013. Hamid Sulaiman is a Syrian artist. He lives and works in Germany (Berlin) as well as in France (Paris). In 2005, he began his studying Art and Architecture at the University of Damascus (Syria) and completed his degree in 2010. From October 2016 to June 2017 Hamid Sulaiman was active as Artist in Residence at the Käte Hamburger Center "Law as Culture". 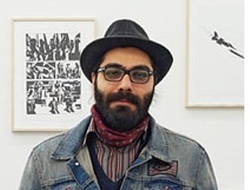 During his time as Artist in Residence at the Käte Hamburger Center for Advanced Study in the Humanities “Law as Culture”, Hamid Sulaiman was working on his 'graphic novel', "82, before freedom hospital". This is the artist’s second ‘graphic novel’, which follows his first well-received piece "Freedom Hospital". Tim Shaw, born 1964 in Belfast, is a sculptor and contemporary visual artist. He studied first at Manchester Polytechnic and then at Falmouth School of Art, where he received a first class BA (Hons) Fine Art degree. He has had a number of significant solo shows throughout the UK, Ireland and internationally. Most recently the major public solo exhibition “Black Smoke Rising”, toured to mac Birmingham and Aberystwyth Arts Centre. During 2014, his work featured in “Reflections of War” at Flowers Gallery in London, and “Back from the Front presents: Shock and Awe – Contemporary Artists at War and Peace” at the Royal West of England Academy. Tim Shaw has undertaken a number of public commissions including “The Rites of Dionysos” for the Eden Project, “The Minotaur” for The Royal Opera House and “The Drummer” in Truro City Centre. A more political side to his work became evident in a number of sculptures responding to issues such as terrorism and the war in Iraq such as “Tank on Fire”, awarded the selectors’ choice Threadneedle prize in 2008, and the installation “Casting a Dark Democracy”. Tim Shaw has been supported by the Kappatos Gallery in Athens, The Kenneth Armitage Foundation, The British School of Athens and The Delfina Studio Trust through residencies in Greece and Spain, and a Fellowship in London. In 2013, he was elected to the Royal Academy and was elected a Fellow of The Royal British Society of Sculptors and a Fellow of Falmouth University. From April 2015 to March 2016, Tim Shaw was active as Artist in Residence at the Käte Hamburger Center for Advanced Study in the Humanities “Law as Culture” where he received the Georg Simmel Artist Stipend for his work on the topic “The Birth of Breakdown Clown”. British artist Giles Walker has been working with robots for the last 20 years. As a member of the guerilla-art group “The Mutoid Waste Company”, he started building kinetic sculptures and robots from materials found in various scrap yards around Europe. He has exhibited his work around the world, touring in Europe, Japan, Australia, Russia and the United States. His widely-noticed project “Peepshow”, in which two cyborg pole dancers draw a link between surveillance systems and voyeurism, was featured at the UK’s first Kinetica Art Fair in 2009 and was included in the Victoria and Albert Museum’s exhibition “Decode – Digital Design Sensations” which presented a selection of the foremost contemporary artists working in the field of digital and interactive design. His remarkable “The Last Supper”, a fully animated sculpture that took one year to complete and consists of thirteen interacting mechanical figures, was exhibited in London and Los Angeles in 2012. It continues its tour through Europe and the United Kingdom with a six month stint due in 2017 at the Science Museum in London. Giles Walker has since exhibited three more large installations in London supported by the Black Rat Gallery. All have involved large scale animatronics. He is currently working on new works for a solo exhibition in London in 2016. From November 2015 to March 2016, he was active as Artist in Residence at the Käte Hamburger Center for Advanced Study in the Humanities “Law as Culture”. Stefan Stößel was born in Bad Salzungen (Thuringia) in 1970. He studied at the Hochschule für Grafik und Buchkunst (HGB) Leipzig, majoring in painting/graphic design under Prof. Arno Rink and is therefore associated with the Leipzig School. In 1998, he was a founding member of the Kunststoff e.V./Kunstraum B2 in Leipzig. Upon receiving his diploma in 1998, he finished his master class studies under Prof. Astrid Klein at HGB Leipzig in 2003. In 2000, he stayed on a stipend at Künstlerhaus Lucas, Ahrenshoop, as well as in Columbus, Ohio. From 2005 to 2008, he worked as assistant to Prof. Neo Rauch at HGB Leipzig. Stefan Stößel lives and works as an independent artist in Leipzig. From September 2014 to February 2015, he was Artist in Residence and holder of the Georg-Simmel-Artist Stipend at the Käte Hamburger Center for Advanced Study in the Humanities "Law as Culture". Ali Samadi Ahadi is a prize-winning director and screenwriter. Born in Tabriz, Iran, he fled to Germany due to the First Gulf War at age 13. Upon graduating from high school in 1992, he studied social sciences, design for electronic media and visual communication in Hannover and Kassel. He has been working as a freelance director and screenwriter for over 10 years. In 2006, he received the German Film Award in the category "best documentary" for his documentary "Lost Children", produced together with Oliver Stoltz, about the fate of child soldiers in Uganda. In 2009, he was awarded the German film critics' prize in the category "Best debut feature film", for his comedy "Salami Aleikum", for which he was also awarded the 2012 CIVIS prize. He received the 2011 Grimme-prize for Information & Culture for his documentary "Iran: Elections 2009". A longer version of this documentary, titled "The Green Wave", was brought to cinemas, and was entered into the Sundance Film Festival. It received numerous further awards at international film festivals in Prague, The Hague, Geneva and Washington. Ali Samadi Ahadi was Artist in Residence at the Käte Hamburger Center for Advanced Study in the Humanities "Law as Culture" from October 2011 till November 2012, during which time he worked on the movie "45 Minutes to Ramallah", which was selected as an official contribution to the Festival des Films du Monde de Montréal "Focus on World Cinema" as well as to the International Human Rights Film Festival in Nuremberg. It further ran as opening feature at the International Film Festival Osnabrück and won the jury and audience prize at the Biberach Film Festival as well as the film and media art prize by the Academy of Arts Berlin. From February until April 2014, Ali Samadi Ahadi continued his fellowship at the Käte Hamburger Center for Advanced Study in the Humanities "Law as Culture" as Artist in Residence and received the Center's first "Georg Simmel Artist Stipend" ("Georg Simmel Künstlerstipendium") to support his project "Die Ministerin. Konzept-, Buch- und Stilentwicklung für einen Spielfilm", which traces and narrates the development of women's rights in recent Iranian history. His project at the Käte Hamburger Center for Advanced Study in the Humanities "Law as Culture" is particularly inspired by Caravaggio’s “David and Goliath”.